The carpet near the back of my Aqua Magic toilet is damp. I cannot see or feel any dripping from the water supply line. Are there internal seals that may be worn or damaged due to use? 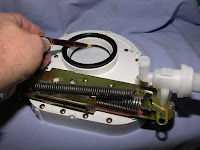 Sonny, indeed, there are many internal seals and gaskets in the Aqua Magic such as shown in the photo here. If the water inlet line is secured properly and not leaking, chances are the water leaks only while flushing the toilet. This is an indication of a leak within the vacuum breaker component located internal to the toilet. 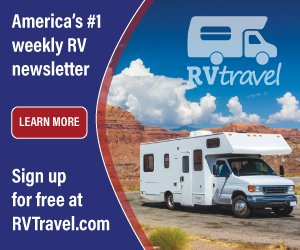 It’s easily replaced and Thetford does have replacement parts readily available, typically at any RV parts accessory store. Occasionally the vacuum breaker may be subjected to highly calcified water that may cause a seal or gasket component to leak if a particle becomes lodged inside. There is an outside chance the toilet to flange gasket may be faulty and the toilet leaks as it drains into the holding tank, but your observation that the carpet is damp only at the back of the toilet (directly below the location of the vacuum breaker), is indicative of a faulty vacuum breaker.